Let us out! Departing Lagos Marina, aptly nicknamed Port Velcro, to make the passage all the way to the fuel pontoon, then onward to Portimao, all of 8nm. As we and many others who had over-wintered in Lagos were preparing to leave, we began getting some of the worst weather for a sustained period that we'd had since arriving in October! After months of cloudless blue skies, we suddenly had lots of cloud and some rain, along with strong winds. All very frustrating but eventually, we made our escape on Tuesday 10th April. After filling with fuel, we headed for Portimao under genoa with a smooth sea and south-westerly following breeze. Despite the patchy cloud, we had some sun and although it could have been warmer for April, it was great to be on the move again. Coincidentally, two other boats left Lagos at about the same time (ok, we have to admit, they were faster and we couldn't catch them, but they are both 42ft catamarans and they did take a marginally shorter route closer inshore! :-) ). When we arrived in Portimao, we anchored near Helen and Marcel's Dakini and Chris and Sue's Nimrod. Other recent escapees from Lagos, Francis and Erica (and their dog Dodgie) on Awake who had been in the boatyard at Portimao for a week also came out to the anchorage. It was a bit breezy at first, but a lovely evening. Woof woof - get down Shep! 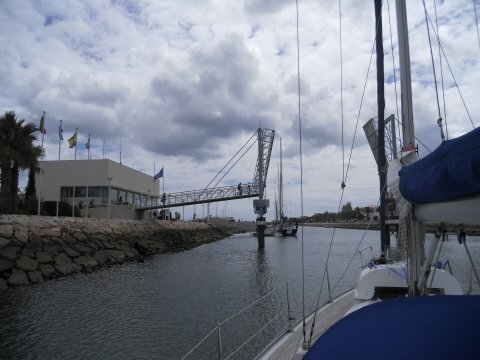 So, back to Portimao... the first outing or should we call it in-ing of our new Manson Supreme anchor. Admittedly it was perfect holding ground, but it did bite first time and we were confident of it holding through the night, which began with the wind at F5. We also rigged the snubber that I had spliced up and that also worked well - two lengths of line spliced to two teardrop thimbles attached via a shackle to a chain hook (all stainless steel fittings). Leading the lines through the fairleads and back to the forward cleats takes the strain off the bow roller and windlass and dampens some of the motion when at anchor in windy conditions. 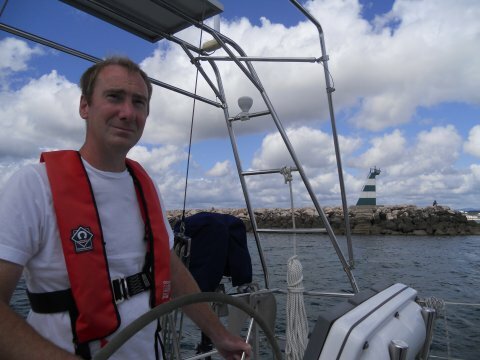 Wednesday, we sailed from Portimao to Culatra to anchor in the lagoon there. Another good passage, this time with both sails set with a lovely breeze on our quarter, very slight sea with the wind offshore again and some sunny spells. We were overtaken by Dakini and Nimrod again, and we were visited by dolphins on only our second sail of the year. By the time we reached the lagoon, the wind was, as forecast, quite fresh and although sheltered from the sea, there was some wind chop coming across the anchorage, so we had a couple of slightly uncomfortable and noisy nights there. 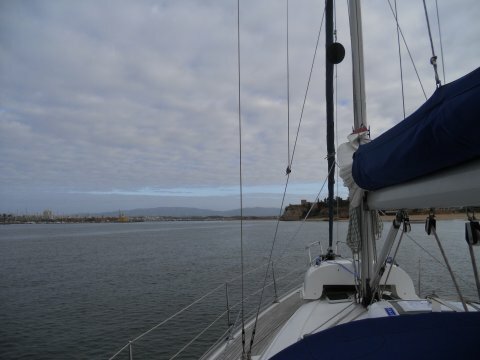 On Friday morning, we moved out to anchor on the seaward side of the breakwater, just south of the island of Culatra in what Dakini and Nimrod had found to be a much calmer spot. We spent a couple of hours anchored there, catching up on some rest before sailing for the Guadiana River. It was a bit of a shame to miss stopping at Tavira, but although it appeared to be more sheltered than inside Culatra, it was another lagoon and as the forecast for the next couple of days was strong and very gusty winds with at least one day of rain, we thought we'd tuck ourselves up in the marina at Ayamonte, where we probably will stay until Tuesday morning. We had a lovely sail with just the genoa, even though we had to reef it a bit to slow us down from doing over 7 knots at times so that we would arrive at the entrance to the river at half flood, as recommended by the pilot guide. By the time we got into the marina, the wind was blowing 27 knots. We thought the office would be closed, as it was now nearly 1900 (actually just realised 2000, we are now in Spain again! ), so didn't radio ahead (we'd also been told that they may not answer or say they have no space) and just drove into the first spot we found, luckily an open berth where we could let the wind take us onto the pontoon. When we were secured, Andy went to the office and was surprised to find it still open! 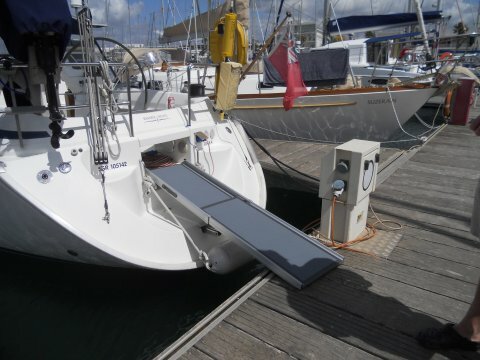 He also discovered that we were actually in a berth intended for much larger boats, although the office staff said due to the strong wind, it was no problem, and we could move to another berth the next day if the wind calmed. We were stern to the wind on the outermost pontoon, and quite exposed to the wind and chop coming across the river so yesterday, despite the wind gusting up to 40 knots and pinning us to the pontoon, we chose a slight lull and sprung ourselves off to move to a berth where we are much more sheltered. Although the wind is still gusting very strongly, we're now bows to it with just the wind and no chop bouncing us about. Yesterday's rain has also cleared, so we'll go ashore for some exploring later. So on Tuesday we plan to go up-river, which is navigable for 25 miles, where we'll be back in Portugal - no Spain - no Portugal - depends which side of the river we anchor!